After feeling very sorry for myself last week and my lack of friend contact Muddy Hubby and I made the decision to get away from the farm for the day and go and visit some very good friends we hadn't seen in a while. It was just lovely and wonderful and delightful. I felt like a kid in a candy store getting to spend time with friends, soak up the time away from the farm and spend the time catching up and just chatting like good friends do. The Muddy Kids were entertained, they spent a large portion of the day on the tyre swing or in the hammock. So quite simply this week I am grateful for the hammock swing for keeping my Muddy Kids entertained so we could chat with friends and enjoy being away from the farm. 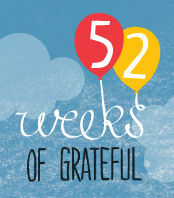 Linking up over at Village Voices where the lovely Bron hosts 52 Weeks of Grateful. What are you grateful for this week? Lovely that you got to catch up with friends, Nat. Hooray for hammocks and tyre swings! Oh yes we all need 'friend contact' there is certainly something super special about that isn't there.